Durable foam pads that fit underneath your sits bones, adding cushion and reminding your body to balance your weight comfortably onto your sits bones. Non-returnable. 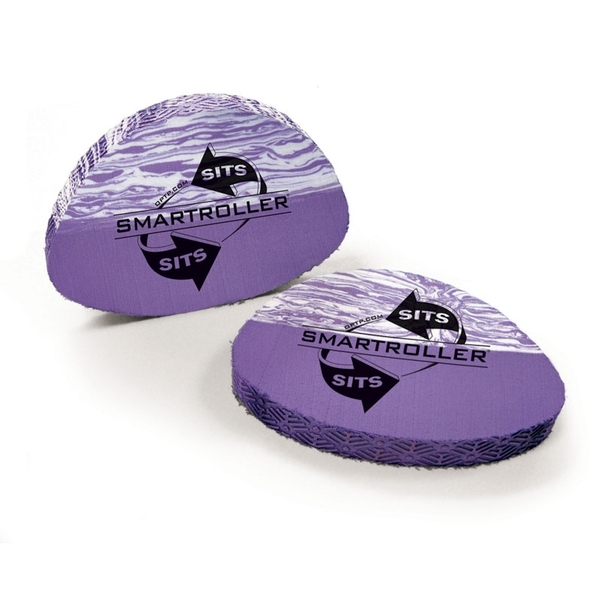 Stacy Barrows’ SMARTROLLER® Sits offer portable and discreet cushion when sitting on any hard surface, such as office chairs, bleachers, benches, the ground, etc. Simply place the Sits cushions under your sits bones. As kinesthetic learning tools, you’ll notice results in minutes as you receive feedback to balance your weight onto your sits bones instead of slumping. SMARTROLLER Sits are also ideal companions for Yoga and meditation. Kids can benefit from using Sits while doing homework. Smartroller links are an innovative, multi-functional therapeutic tool. As a physical therapist and yoga instructor, I integrate links into my practice with patients who have neurological and orthopedic diagnoses. I find stacking links into a roller to provide the optimal position for facilitating motor control postural exercises and experiencing a more effortless breath. When I teach yoga, links are optimal for restorative poses as well as standing poses. I exclusively recommend Smartroller links and rollers to my patients for clinic and home practice because they are the best multi functional therapeutic tool on the market. I like the smart roller very much. It is comfortable to lie on on either side. I am just beginning to explore how to use it. The material is firm, but not too hard. Healthy Sitting On The Go! Smart Sits are great for helping my clients experience the sensation of support in a seated position—and once experienced, many people find they don’t want to live without them. No chair can be relied upon to establish good posture, but these clever props can be positioned in a variety of ways to properly balance the trunk over pelvis. And they can be thrown into a bag for travel, movies, long lectures, etc. I personally use this product on long drives, airplanes and during extensive paperwork time. It has helped alleviate the sciatica that develops from prolonged sitting. I have also used them as a tool for teaching patients body awareness and many of my patients have found the Sits helpful for assisting in maintaining improved posture.